BROCKTON — Black cat whiskers protrude from a wooden box. It’s an unprepossessing object, plain and sparse. But run your hands over the 48 delicate whiskers, and angels sing. In Alison Kotin’s “Whisker Organ,” the motion digitally triggers harmonies from a 30-voice chorus. “Whisker Organ” stands near the entrance to “Game Changers: Fiber Art Masters and Innovators,” a new show at Fuller Craft Museum. It is perhaps the most maverick piece in an exhibition that aims to spotlight out-of-the-box experiments in fiber art. Other pieces are made of stone, metal, glass, a wasp’s nest, and melon rinds. If material doesn’t tie these artworks back to textile traditions, technique does, or form. Pioneers in the exhibit include the late Ed Rossbach, who has one of his playful paper baskets on view, and Arline Fisch, who applies textile techniques to metal. There are many swoon-worthy items on display, marvels of technical bravura. But although “Game Changers” has its moments, it doesn’t feel particularly game-changing. Wall text says, “Fiber artists are moving beyond a process-and-materials-dominated creative approach to a more expansive and idea-driven view.” But this show is deeply grounded in tradition, and sputters when it comes to big ideas. Among the whiskers and beach stones, you’ll find baskets made of twigs and quilts made of fabric. Randall Darwall and Brian Murphy’s “Quilt #14,” gorgeous with its grids within unruly grids and sumptuous colors and textures, goes under the “masters” heading in this show’s title — it’s not innovative. Sebastian Smee’s picks for notable art exhibitions around the Boston region this week. Across the gallery hangs a more daring quilt, Arturo Alonzo Sandoval’s “Cosmic Ring No. 1,” with big, shiny, iridescent circles against a checkerboard pattern. Sandoval made this giddy eye-catcher from mylar, several types of film, and monofilament thread. You’ll want to wrap yourself in Darwall and Murphy’s quilt, but this one feels like it could bounce you to the moon. The materials in Sandoval’s pop-art-tinged piece reminded me of conceptual artist Dinh Q. Lê, who weaves photographs. Inspired by his aunt, who wove grass mats in Vietnam when Lê was a child, he uses warp and weft to explore his fractured identity as a Vietnamese American, and the complexities of the relationship between the United States and Vietnam. Many artists are, like Lê, elbow-deep in textiles, utilizing traditional techniques to make pieces that prick holes in tradition and ask larger questions. Think of knitted works by Rosemarie Trockel and Dave Cole, which challenge assumptions about femininity and masculinity. 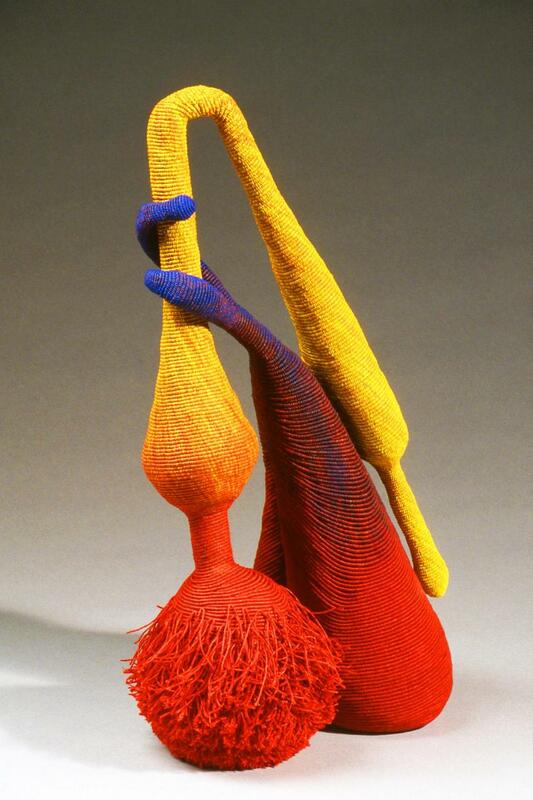 These artists, who are not in this show, work in fiber. They are not fiber artists. This raises the tired old question about craft versus art. What we see at the Fuller Craft Museum, in this exhibition and others, is an allegiance to notions of beauty, technical wizardry, and materials that can keep artists from blowing open into bigger ideas and feelings. Two examples from this show: Jan Hopkins’s “Odd Pair,” marvelously crafted from wasp-nest fiber, hydrangea petals, melon rind, and more, depicts two shoes, one as a cat and one as a mouse: inventive materials applied to a cutesy, tired idea. Linda Behar’s “Monet’s Garden,” a faithful reproduction of a photograph by Behar depicting a lush scene familiar from Monet’s Giverny paintings, hand-embroidered with infinitesimal stitches, is a technical feat, but there’s nothing we haven’t seen in her imagery. To be fair, there are wonderful, odd, and provocative objects on view, such as Jane Sauer’s “At Last,” a vibrantly colored basket piece, in which one bottom-heavy form wraps its sweet prongs around another in a “he ain’t heavy, he’s my brother” gesture. Adrienne Sloane’s “truth to power” installation of knitted wire features black figures suspended in the air, head and legs dangling, amid great strands of red that drop to the floor like inverted lily pads. Sloane freights the piece with vulnerability and threat. But most of the best works here are straight-ahead textiles. 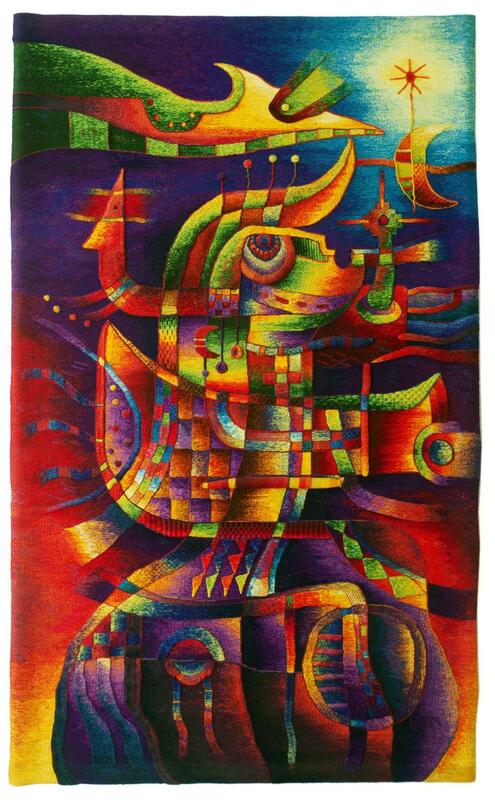 Peruvian artist Maximo Laura’s hand-woven tapestry “Warrior of Light in the Blue Night,” majestic in warm jewel tones, depicts an almost monstrous warrior, his giant head studded with game-board patterns and shifting tones. Tufted textures rise off the surface of the piece, imbuing it with three-dimensionality. Archie Brennan’s tapestry “The Lady and the Gypsy” hits just the right notes of wry humor, without dipping into that bugaboo of crafts, whimsy. Brennan has taken a small detail from a 16th-century tapestry and reinterpreted it on a large scale. The lady, in her glittering robes, stands in front of the turbaned gypsy, representing the ends of the class spectrum. But both face us, looking askance. What has happened? Are we the source of their displeasure? Several woven wire pieces display terrific virtuosity. The title of Anastasia Azure’s “Landau for the Maharaja” suggests a royal carriage. It’s a double weave, incorporating silver, copper, brass, and nylon. Azure wove it flat, but off the loom, she opened the two layers into petal-like flutes that spring from a brooch at the center. At 36 inches in diameter, it’s imposing, but frothy and delicate. Similarly, Lanny Bergner’s “Blue Elixir” crafted from screen wire, nylon monofilament, and silicone, is nearly ethereal. It hangs from the ceiling, and although it’s no lamp, gold fibers inside the translucent pod of mesh sparkle and pick up the light as if it were glowing from within. In the end, the spectacle here is in the craftsmanship, not the concepts. This show anticipates “Fiber: Sculpture 1960-present,” which comes to the Institute of Contemporary Art in October. There, I imagine, we’ll find a different slant altogether. Correction: In a previous version of this review, a work by Linda Behar was mischaracterized.